As we know that fact that our body continuously loses water through breathing, sweating, digestion and excretion So it's important to rehydrate our body by drinking fluids and eating foods that contain water. Though most of the people prefer drinking normal or cold water specially during summer season but recent scientific researches have found that drinking warm water during all seasons is more beneficial regarding our health, fitness and beauty. Although drinking warm water is more beneficial as compared to normal water but keep the temperature in between 120°F to 140°F and avoid exceeding temperature more than 140°F. Otherwise over-warm or too Hot water may damage your taste buds, sensitive lining of the oesophagus and digestive tract. In the following lines we are going to discuss how drinking warm water can be helpful to your overall health, fitness and beauty. Let's have a look on some amazing benefits of drinking Warm Water. Drinking of warm water is highly beneficial in getting rid of toxins from body as warm water temporarily raises the core body temperature, your body begins to sweat in order to cool down. Sweating process, is one of the best way to remove toxins from body. Drinking more warm water also makes you pee more which is an other great way to expel toxins from body. For woman is it highly recommended to drink at least 2.5-3 liters of warm water while for men it is essential to drink 3-3.5 liters of warm water on a daily basis. Warm Water helps to improve the blood circulation, which aids to transport oxygen and nutrients to your tissues and organs in your body more efficiently. Warm water also helps to burn out the body fat and also breaks down the fat deposits present in the nervous system. Proper blood circulation is essential for your muscles and nerves. Warm water, widens the blood vessels and stimulates the blood flow to rush toward the intestine, aiding the digestive process. Warm water and Improved blood circulation is also a good news for people with sluggish or slow blood circulations. Drinking warm water is very helpful to get relief from nasal and throat congestion including cold, cough and sore throat. It aids in dissolving the thick phlegm (balgham) and removes them more efficiently from your respiratory tract. Warm water is also very beneficial in improving digestion. It stimulates your digestive gland to begin working more efficiently. Warm or hot water can break down the food faster than other liquid. In that, it uses less energy to breakdown the food. Hence, it digests the food nutrients faster and wastes toxin from body more effectively. Constipation is often caused by a lack of water in the body. Drinking warm water on an empty stomach is very helpful in getting rid of acute or chronic problem of constipation. Warm water helps your digestive system to work more efficiently. It aids in breakdown of food and makes the movement of the stool particles through the intestine smooth and less painful. 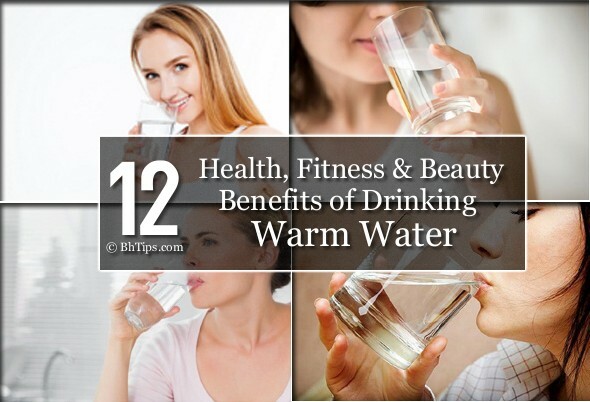 Warm water is very beneficial in weight loss. Warm water increases your body temperature, which increases your metabolic rate. An increase in metabolic activity gives the body the ability to burn more calories more efficiently. Warm water is 0 calorie drink that you can trust all the time to prevent hunger. If you drink warm water in early morning it breaks down body fat more quickly throughout the day. For better results, try to drink warm water along with lemon juice. Warm water is very helpful to prevent painful menstrual cramps. The water relaxes the muscles within your uterus and provides you with relief. The heat of the water has a calming and soothing effect on the abdominal muscles, which in turn cures the cramps and spasms. In addition to water warm drink, you can also place a hot water bottle on the lower section of your abdomen for further relief. Warm water is also beneficial to get relief from arthritis pain. If you are having a back pain or even arthritis symptom then you can drink warm water or bath with hot water. Warm water increases blood circulation and gives relaxation to muscles and nerves. People that have arthritis might get an extra benefit from using warm water to calm their central nervous system. In addition, warm water calms joint pains, muscle cramps and muscle spasms. Warm water is highly beneficial in slowing down the ageing process. A glass of warm water in the morning stimulates detoxification and prevents many different diseases. Drinking warm water helps a lot for cleaning and flushing out of toxin and free radicals that can age you faster. Warm water, can help repair skin cells which can lead to an increase in the elasticity of your skin and prevents the formation of skin wrinkles or fine lines. Warm water is also very helpful to get a healthy, glowing a youthful skin. Warm water improves blood circulation that automatically transports the nutrients to skin cells. As a result, there will be healthier and glowing skin. Hydrated skin is less prone to get premature wrinkles or fine lines. Warm water can act as an internal cleanser, eliminating the root causes of acne-related infections, promotes the growth of new skin cells and helps a lot to give you acne-free, smooth and glowing skin. Drinking warm water is also beneficial for attaining and maintaining long, strong and healthy hair. Warm water not only improves blood circulation but also facilitates the transfer of essential nutrients to hair roots which in turn results into improved hair growth and volume. In addition to hair growth, warm water also keeps your scalp hydrated and helps fight against dry scalp or dandruff. Warm water helps a lot in soothing your nerves and you feel more relaxed and experience a better sleep. If you drink warm water throughout the day, during your meals and specially before going to bed, it will help you sleep more peacefully and soundly. It also improves your sleep quality and you will feel more active and energizes when you will wake up in the morning.